StorySpeak invigorates ideas, stimulates cooperation, sways attitudes and opinions and arouses growth. These teachers know that a great storyteller must first capture and hold the student’s attention and second, transport them into another world. And they know the way to keep those students in that other world is by continually increasing the tension in the story until the conclusion is reached, the lesson learned and the message delivered. 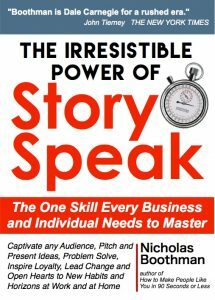 StorySpeakers earn more, out-perform, do better in school and college, get hired and promoted faster and get better service in person, and over the phone than fact-speakers.